This lecture is given in honor of Max L. Williams, Jr. (1922-2013) (MS '47, ENG '48, PhD ’50) who was a faculty member of GALCIT from 1950-65. He was a distinguished engineer, scientist, and academic administrator, and also provided guidance to industry and government that facilitated technology transfer. He made pioneering contributions to fundamental developments in fracture mechanics and viscoelasticity. How do the physical, mechanical and rheological properties of cells influence the onset and progression of human diseases, and vice versa? How do the dimensions of small constrictions for passage of cells in the human body determine their surface to volume ratios and shapes? What new platforms do the latest experimental techniques from engineering, physics and chemistry offer for isolating rare circulating tumor cells, vesicles and exosomes for disease diagnostics, therapeutics, and drug efficacy assays? We discuss these and other related questions as well as some potential clinical applications by recourse to our recent research results at the intersections of engineering, natural sciences, and medicine. The discussion is guided through specific examples from experiments and computation in the context of infectious diseases, hereditary blood disorders, and human cancers. 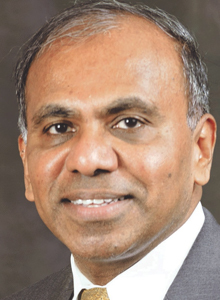 Subra Suresh is President-Designate and Distinguished University Professor at Nanyang Technological University, Singapore where he is also a Senior Advisor to Temasek International. He has previously served as the President of Carnegie Mellon University, Director of the National Science Foundation, and Dean of MIT’s School of Engineering. Suresh is an elected member of all three branches of the US National Academies – Engineering, Sciences, and Medicine, and has also been elected to the American Academy of Arts and Sciences, National Academy of Inventors and ten other academies based in Europe and Asia, and has been awarded 12 honorary doctorate degrees. He has authored three books, 300 research articles and 25 patents. He has been widely recognized for his research into the properties of engineered and biological materials and their implications for human diseases. His recent honors include: the 2015 Industrial Research Institute Medal; the 2013 Franklin Medal in Materials Science; the 2012 Timoshenko Medal and the 2011 Nadai Medal of the American Society of Mechanical Engineers; the 2011 Padma Shri award from the President of India; and the 2007 Gold Medal of the Federation of European Materials Societies. He is an independent Director of the Board of HP Inc., Palo Alto, and a member of the Science, Technology and Innovation Council created as an advisory body to the CEO and Management Board of Siemens AG, Munich, Germany. Suresh was a Gordon and Betty Moore Distinguished Scholar at Caltech and the Clark B. Millikan Visiting Professor at GALCIT in 2004 and 1999, respectively.